Welcome to Hinton Football Club. Away Colours: Blue shirts, White shorts and socks. Child Welfare officers: Simon Hall & Graham Goodfellow. First Team Management: Stuart Jones, Mike Marsden, Darren Birch. Reserve Team Management: Ben Dallow, Brad Priday. U10: Steve Cuss, Darren Birch, Rod Haslam. U12: Wayne Teale, Paul Thomas. U14 Girls: Dave Hopson, Duncan Price. U15: Mark Lambert, Alan Preissler. U17: Craig Greenhalgh, Colin Early. 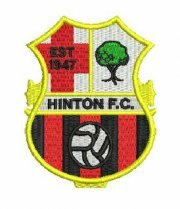 Hinton were formed in 1947 and now run football teams from the ages of 8 up to senior level. They have an inherent base in the South Wye area of Hereford and via a dedicated band of Managers and volunteers are seeking to expand and progress as a club. This season we celebrated our 70th Anniversary with a well attended Anniversary Ball, where Hinton players and managers both young and old got together and discussed local football throughout the last 70 years. Hinton FC 1st team are also proud winners of the 1st ever Herefordshire County Football League premier Division title. In the mid 1980’s the then committee took up the opportunity to purchase the Broomy Hill site outright, much to the envy of its local rivals. In 2000, with the aid of vital grants from the South Wye development fund and Advantage West Midlands, the executive committee at Hinton installed floodlights at Broomy Hill. In 2004 Hinton were awarded the FA Charter Standard Junior Club award and in 2006 were awarded the FA Charter standard Adult Club award. Hinton were also recently acclaimed Herefordshire Charter standard club of the year by the Herefordshire Football Association, a great achievement and just reward for all the time and hard work put in by club members. Hinton FC have also been awarded the Charter Standard Community Club award, as well as many personal awards recognising personal involvement in Herefordshire football, thanks wholly to the dedication and hard work of all its coaches and volunteers. We work towards keeping our standards high and renew our charter standard awards every year by continuously updating and renewing our training and codes of conduct. This season Hinton are running 2 senior men’s sides, U14's, and U9's Junior league boy’s sides, as well as a Saturday morning "starters" club where our FA qualified coaches teach children basic soccer skills, teamwork, fair play and fun with football.